When I saw the ad of this tool on Facebook I fell in love with it. 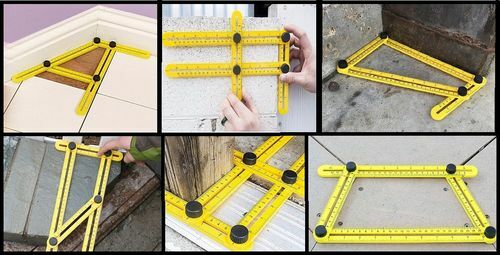 With such tool you can trace or copy (replicate) any 4 sides polygon, any contour and any angle. That’s handy and I had to make my own ! (think self-sufficient and DIY). One by one I made the counterbored slots at the router table using a 1/4” and a 1/2” straight bit according to the bolts and the aluminum track flat nuts I used. For more photos and all construction details, please watch this page of my blog. Realy looks fantastic and practical. I see lot of practical use here as you posted on those photos. This is a nice shop-made tool. Great job on it. Very well done. As it was about $3 even a tightwad,like I am, could not afford to make one. Although yours will outlast mine purchased one. In my favorite for the future !! Nice job Serge, I have one of the $3 plastic ones and they are handy. thats very cool and nicely done Serge and I’m sure it costs much less and its made of wood !!! KUDOS !!! I have to say Serge, I like yours 100 times better than the store bought one. It has grace, style, strength, and the dignity of being made by a true craftsman. PS: I wasn’t going to buy one of these, but now after having seen yours, I intend to make one out of some scrap I will have from a big project I’m currently working on. And lastly, to all my Lumberjock friends. Do yourself a favor and sign up to Serge’s blog if you haven’t already. He is one of the better content contributors out there. Great tool to have around . Really fine version, nice and simple to make and use. As always you find ways.